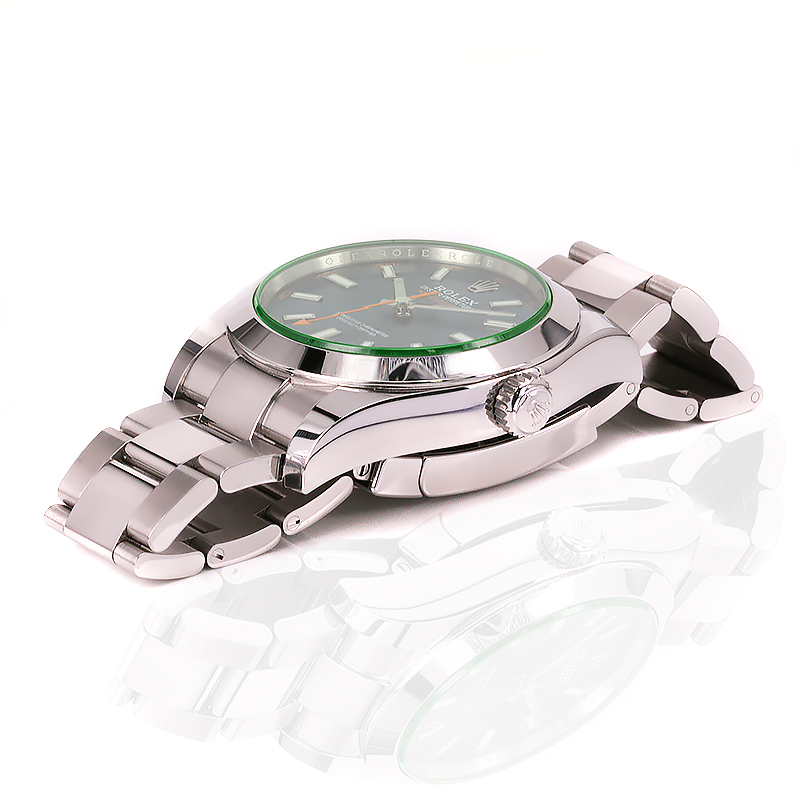 Product code: W1188 Categories: Sold Items, Sold Rolex Watches. As far as second hand Rolex watches come, they don’t come any younger than this 2017 Rolex Milgauss 116400GV with box and papers. Bought brand new in December 2017, this Rolex Milgauss is of course in brilliant condition and still under factory warranty. The Rolex Milgauss was designed to withstand a high magnetic field, and has become a very handsome yet rugged looking watch that is increasing in popularity year after year. With the green glass and the new Rolex Z-Blue dial which was introduced in Rolex Milgauss models from 2014, the green tinted glass and the iconic orange “lightning bolt” second hand, this is such a great looking watch for any occasion, day or night. With the watch case measuring the iconic 40mm in size plus the Rolex screw down crown, the smooth bezel and absence of a date window and therefore date window magnifier, gives the Rolex Milgauss such a clean smooth look. 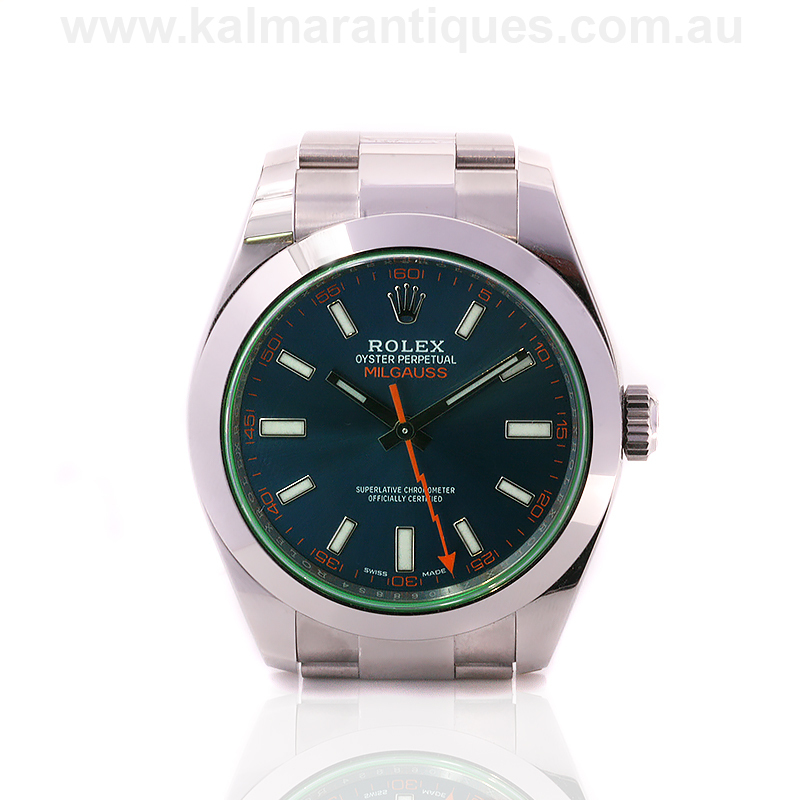 With a new price of the Rolex Milgauss being $10,350, this is a chance for the astute buyer to purchase this watch for over $1,000 less. Tag: 2017 Rolex Milgauss 116400GV. The Rolex Milgauss was first in 1954 with the reference 6541. 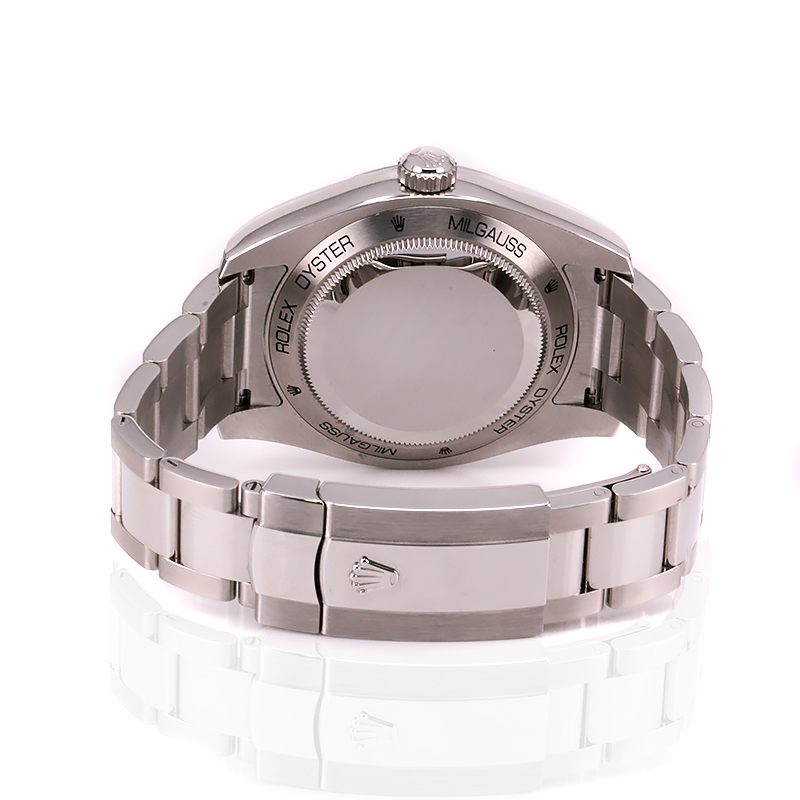 Designed as an antimagnetic watch that was specifically for those who worked in power plants, medical facilities, and research labs. This was due to the fact that these people had a problem with any electromagnetic field greater than 50 gauss, as it would disrupt the timing of a watch. Therefore they either had to deal with an inaccurate watch or simply not wear a watch. However, the release of the Milgauss changed that. Tested in the 1950’s by the European Organization for Nuclear Research (CERN), the world’s pre-eminent particle physics laboratory, it was determined that the Milgauss resisted magnetic fields up to 1,000 gauss. This was a huge technological advancement, not only for Rolex, but for the scientific community. CERN was one of the first scientific institutions to test the Milgauss, however other scientists and institutions soon followed.